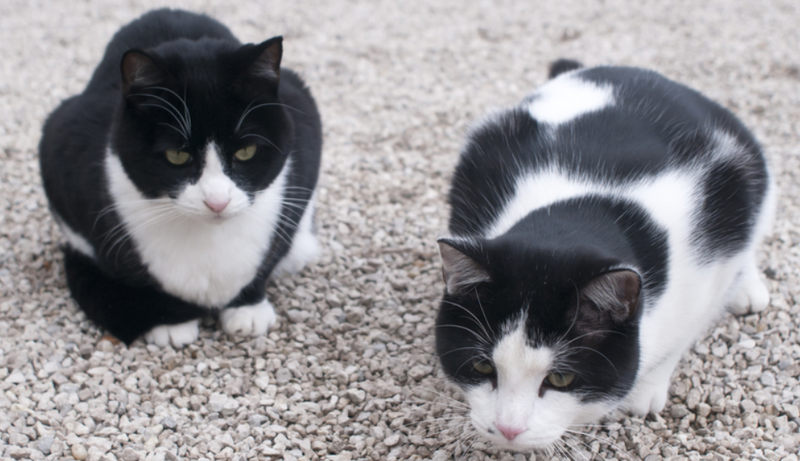 Who Is Dumping All These Tuxedo Cats at a California Animal Shelter? A shelter in California is overrun with tuxedo cats, thanks to one person who keeps bringing them more. All the cats, which range in age from kitten to full-grown, appeared to be in good health, with no fleas or diseases. The humane society is simply overrun with animals and is having trouble housing the abandoned felines. "Every cage is full and our staff is overloaded trying to care for them all," Bloch said. "It's putting a big strain on us." "We don't know if this person is some kind of hoarder or if they are just a well-intentioned owner," Bloch told SF Gate. The shelter can identify the person who is doing this thanks to their surveillance cameras, but they do not want to punish or scare them off. They just want the person to get some information about spaying and neutering. Bloch said they were just concerned and wanted to help break the cycle of constant litters. Hundreds of Cat Overlords in similar uniforms, amassed together in the same space. What could this possibly mean? Could they be moving away from individual strikes against their human caretakers and launching into phase two, with coordinated group invasions? What message are they trying to send to us? And what should our response be? In all seriousness, I hope the shelter is able to find this person and get them some help with their animals. Clearly, this isn't something shelters are physically capable of supporting as a long-term solution.